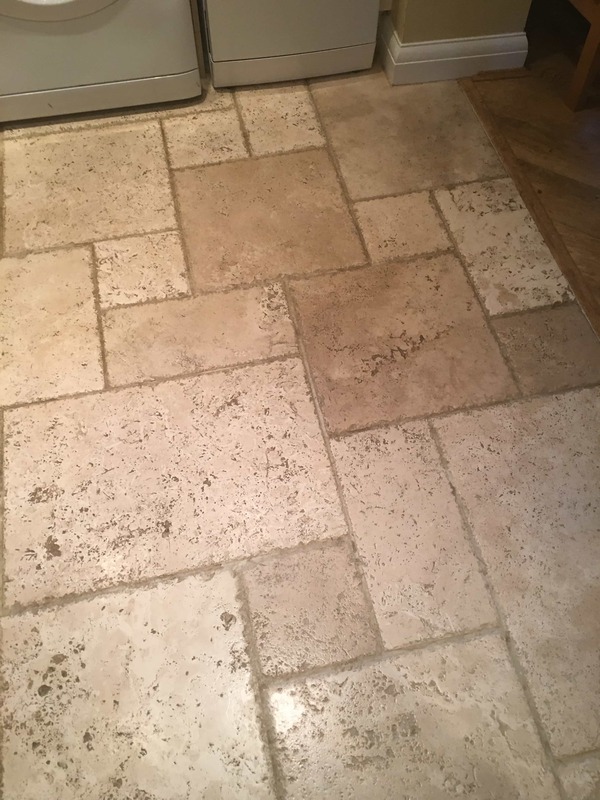 Travertine is a beautiful product however like all-natural stone it needs to be protected with a sealer if you want to keep it looking its best. 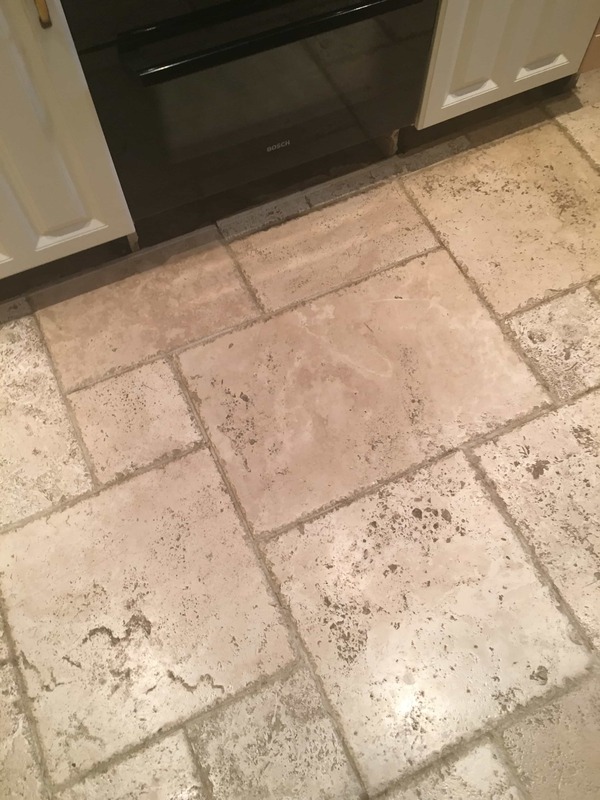 The trouble is sealers wear down with foot abrasion eventually allowing dirt to become ingrained in the stone at which point it becomes difficult to clean. 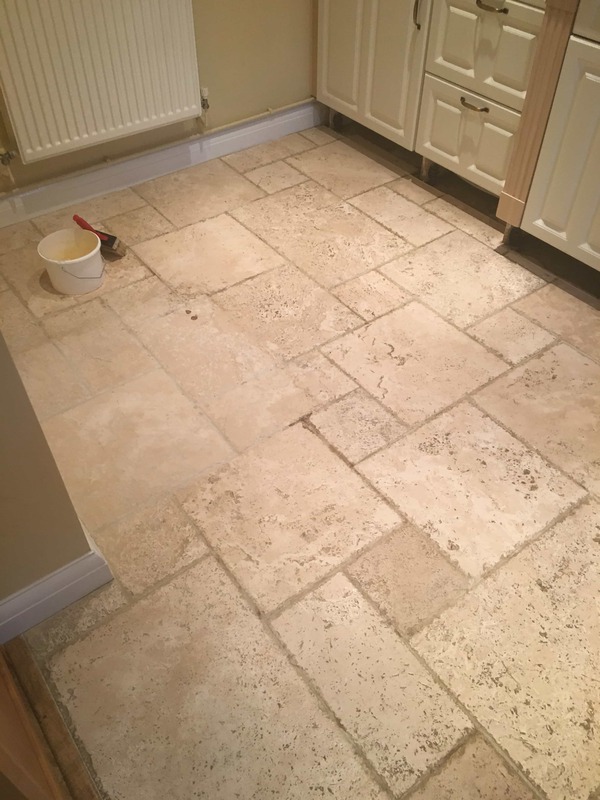 This was pretty much the issue with this tumbled Travertine floor in the kitchen of a house in Godstone, East Surrey. The owner was fed up with the appearance of the floor and asked if we could anything to improve it. I went over to take a look and could see it was as suspected the usual problem of the sealer wearing off and needing replacing. Before we could do that though I would need to remove any remaining sealer and deep clean the tiles to extract the dirt. Fortunately, it was only a small Kitchen and summer time, so I was confident I could do the whole floor in a day. The first thing I needed to do was to remove the plinths from the kitchen units to prevent them from encountering the cleaning products. 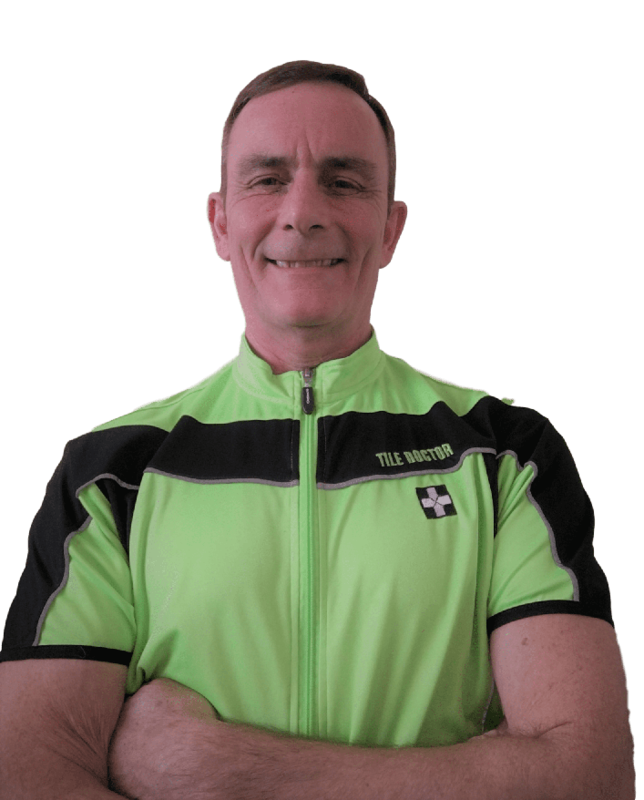 Next and working in sections I started applying Tile Doctor Remove and Go which is a powerful tile coatings remover that would strip what was left of the old sealer from the floor. This is important, so we could get down to the base stone, otherwise we would end up with different levels of sealer which would affect the overall appearance of the floor. I left the Remove and Go on the Travertine for about ten minutes before scrubbing it in by hand with a scrubbing brush. Normally I would use a machine for this but given the size of the floor that was not a practical approach. 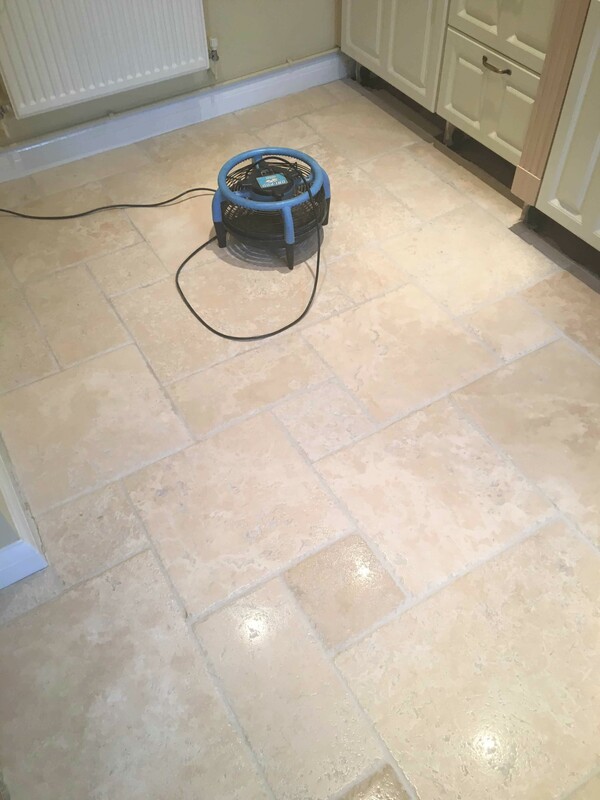 As well as removing the sealer this process also got the Travertine and Grout clean and after rinsing off the now soiled solution with water and extracting it with a wet vacuum the floor was looking much improved. 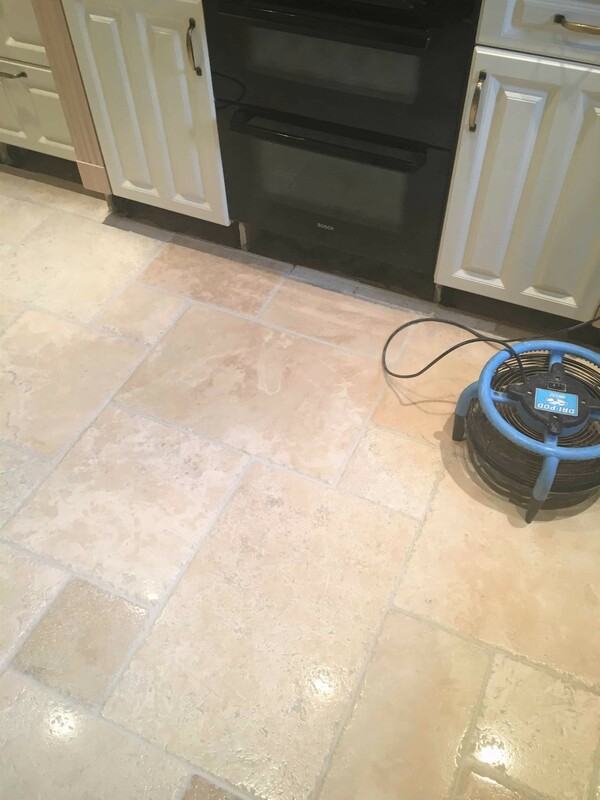 I inspected the tile and grout at this point and spot treated any areas that needed further attention using a repeat of the previous process. Once I was happy I setup a couple of air dryers to speed dry the floor. After speed drying the Kitchen floor for a couple of hours, we had a moisture content reading low enough to apply a coat of Tile Doctor Ultra Seal which is an impregnating natural look sealer that works by occupying the pores in the stone thus preventing dirt from becoming ingrained in there. Speed drying for a further hour then allowed the application of two coats of Tile Doctor Seal and Go to produce a lovely finished look that really brightened up the kitchen.